On Wednesday, seven players who made their way through pre qualifying at the St. Francis Health System ITA All American Championships in Tulsa will have a chance to make the main draw with one more win. Four of them, all freshmen, have won six matches in the past four days: AJ Catanzariti of Texas A&M, Logan Staggs of Northwestern, Robert Kelly of North Carolina and Aleks Vukic of Illinois. The other three pre qualifiers were seeded in pre qualifying, so played "only" three matches Saturday and Sunday: Jack Murray of North Carolina, Jonathan Ho of Wake Forest and Tomas Stillman of Texas-San Antonio. It's impossible to say for sure whether the no-ad format is responsible for all the upsets, or if it is simply an indication of the depth in the men's game, but of the 32 seeds who started in the qualifying draw of 128 only four remain, with highest being No. 10 Andreas Bjerrehus of Virginia Tech. Complete results from today's singles matches can be found at the ITA tournament hub page. The women's ITA Riviera All-American is playing two rounds of qualifying today, with the final round on Wednesday. Michigan's Ronit Yurovsky, the top seed in qualifying, apparently moved into the main draw, with a lucky loser taking her spot at the top of the draw. Results of the women's matches will eventually be posted on the ITA tournament hub page. The ITF Grade 4 in Wichita Falls is being played this week, and so far the top seeds have made it through the first two rounds of play. Alexander Lebedev(1) and Emil Reinberg(2) have advanced in the boys draw, as has last week's winner in Waco, unseeded Ryan Storrie of Great Britain. Gabby Pollner(1) and Miranda Ramirez(2) are through to the third round, but last week's Waco champion Kylie McKenzie retired in the second set, after winning the first, in her opening round match against No. 6 seed Alexa Bortles. At the $100,000 Sacramento Challenger today, Jared Donaldson, Bjorn Fratangelo, Daniel Nguyen(USC), JP Smith(Tennessee), Marcos Giron(UCLA) and Elias Ymer of Sweden were among the first round winners. Top seeds Sam Querrey and Tim Smyczek also moved into the second round with victories today. Qualifying is complete at the $10,000 women's tournament in Hilton Head, with Jessica Failla, Erica Oosterhout, Amy Yang, Usue Arconada and Caroline Dolehide among those earning spots in the main draw. Marie Norris, Rianna Valdes and wild card Sophie Chang won their opening matches in the main draw, as did US Open girls champion Marie Bouzkova of the Czech Republic. Sixteen-year-old Stefan Kozlov received a wild card into the main draw of the $100,000 Sacramento Challenger, and he made the most of it, defeating Ryan Harrison 6-1, 3-6, 6-3 in a first round match today. 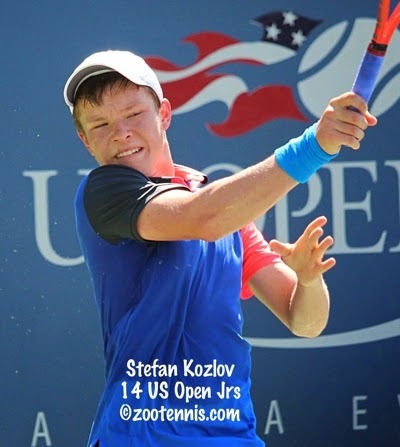 Kozlov had won a qualifying match this year at the US Open, beating Mitchell Frank of Virginia in the first round, and he had won a qualifying match at the Lexington Challenger this summer, but he had not posted a main draw win above the Futures level in his career until today. Harrison, who lost to 17-year-old Jared Donaldson last week, is in a terrible slump, having won only two matches since April-one in the Nottingham Challenger and one in the Winston-Salem 250. His ATP ranking, at 106 this time last year, has fallen to 183. Kozlov's second round opponent is the winner of Tuesday's match between JP Smith(Tennessee) and Bradley Klahn(Stanford). In the final round of qualifying today, Mitchell Frank and Alexander Ritschard of Virginia lost, with Liam Broady, Eric Quigley(Kentucky), Dimitar Kutrovsky(Texas) and Marcos Giron(UCLA) reaching the main draw. Other first round winners were Denis Kudla, James Magee(NC State) and Rhyne Williams(Tennessee). Sam Querrey and Tim Smyczek, last week's finalists in Napa, are the top two seeds again this week in Sacramento. The only women's Pro Circuit action in the United States this week is the $10,000 tournament in Hilton Head. Qualifying is still underway there, but the draw is out, with 20-year-old Jessica Pegula making her first appearance of the year after being out due to knee surgery. She is the No. 4 seed. Prequalifying finished yesterday for the ITA Riviera All-American in California and the St. Francis All-American in Oklahoma, and the men began their qualifying today, with a 128-draw that will produce 16 qualifiers by Wednesday. The pre qualifying draw was 256, with some of the competitors required to win four matches in two days just to get into the qualifying. Eleven of those 16 went on to win their first qualifying match today, and they will be right back on the courts Tuesday for another round. Three of the top four qualifying seeds lost in today's first round: No. 1 Jeremy Efferding(Texas A&M), No. 2 Max DeVroome(USC) and No. 4 Ben Wagland(Georgia). Wayne Montgomery, who was not seeded but had been undefeated in his brief career at Georgia this fall, lost to Ben Lott of Drake. Complete draws can be found at the ITA hub page. The women's draw is smaller, with a 64-draw for the pre qualifying, but no byes for seeds. 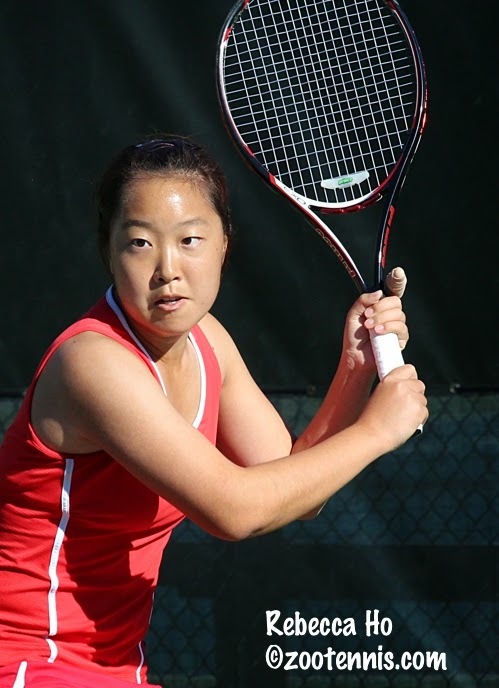 Of the eight pre qualifiers on the women's side, only one, top seed Lynn Kiro of Texas Tech, managed to win three matches over the weekend to earn a spot in the qualifying. The women had today off, with their three rounds of qualifying starting on Tuesday. Two matches will be played Tuesday and the final round will be Wednesday, with eight qualifiers reaching the main draw. The women's main draw is a 32-draw; the men's is 64. Ronit Yurovsky of Michigan and Taylor Davidson of Stanford are the top two seeds in qualifying. Complete draws can be found on the ITA hub page. 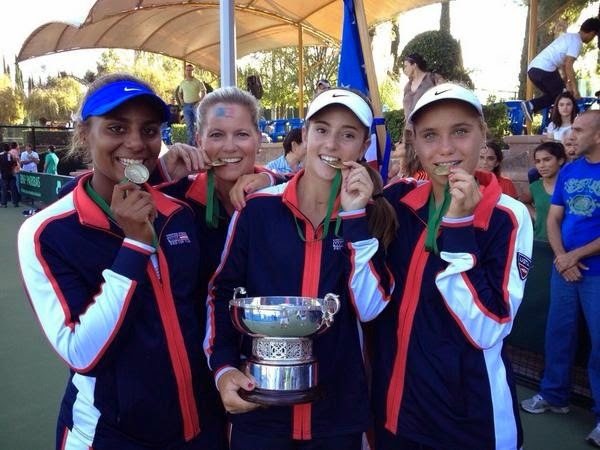 Sweeping both titles at the Junior Davis and Junior Fed Cup competitions is a rare occurrence. Prior to today, it had only happened four times since the 16-and-under competitions began in 1985. In 2008, the United States won both, and matched that today, with the girls defeating unseeded Slovakia 3-0 and the boys taking out No. 4 seed Korea by the same score. The 2008 teams--Christina McHale, Kristie Ahn and Sloane Stephens, seeded No. 1; Evan King, Denis Kudla and Raymond Sarmiento, seeded No. 3--didn't lose a match the entire tournament, which features three round robin matches to reach the semifinals of the knockout round. The 2014 teams were similarly dominating, with the top-seeded girls going 15-0 in their matches and the second-seeded boys doing the same, with all five victories clinched before the doubles match was played. William Blumberg started the day with a 6-2, 6-2 win over Chan-yeong Oh at No. 2 singles, getting a break in the third game of each set and never relinquishing it. Blumberg mixed up his attack, coming in occasionally to keep Oh guessing. He also served better than Oh, showing few nerves until the final game. Even then, although he made two errors on his two match points, he recovered to win the next point both times and on the third match point, it was Oh who missed, sending a forehand wide. The No. 1 singles match was expected to be a close one, with Michael Mmoh having suffered a 4-6, 6-3, 7-6(5) loss to Yunseong Chung in the first round of the US Open junior championships earlier this month. Mmoh's 6-2, 6-2 victory started that way, with four holds of serve, but Chung was broken when Mmoh's defense induced an overhead error from Chung on game point. Mmoh held and broke again, and leading 5-2, claimed the set with a forehand winner on his third set point. Mmoh fell behind 2-0 in the second set, but got the break right back and broke Chung the next two times to take a 5-2 lead. Serving extremely well in the final game, Mmoh took a 40-0 lead, but had to save a break point before collecting the win. Blumberg ran to give him an exuberant shoulder bump in celebration of the second ITF World title they have won together. Blumberg, Mmoh and Francis Tiafoe captured the World Junior Tennis 14-and-under competition Championship in 2012. At the same time, the girls final was also being contested. Tornado Alicia Black was broken at 4-4 in the first set by Tereza Mihalikova of Slovakia, but Mihalikova was unable to finish the set off and it went to a tiebreaker. Black saved a set point with a good serve at 5-6 and got her chance with a good slice approach shot that Mihalikova got to but sent the reply long. Mihalikova missed a forehand wide to give Black the set, and after over an hour of play, Black had edged ahead. She kept her level, but Mihalikova did not, and with Black's 7-6(6), 6-0 victory, the US could look to Bellis to clinch, just as she had done to win the World Junior Tennis title last year. Viktoria Kuzmova started poorly, barely winning any points to start the match, while Bellis was playing patient but aggressive tennis and making few unforced errors. Twenty-four minutes later, Bellis had taken the first set 6-0, and shortly thereafter was serving at 2-1 in the second set. She lost that game and the next six, with Kuzmova taking a 2-0 lead in the third set. Kuzmova had put any nerves behind her and was in control of the match at that point, but Bellis didn't concede, breaking Kuzmova two consecutive times to take a 3-2 lead. She was broken back for 3-all, but Bellis received a couple of gifts from Kuzmova in the next game in the form of a missed routine volley and a double fault on game point. Bellis held at love and Kuzmova would have to hold for the first time since the first game of the set to stay in the match. Kuzmova had two game points, but couldn't convert either and after saving one match point with a forcing backhand, she netted a forehand to give Bellis her second match point. A Kuzmova forehand went long and Bellis fell to the ground on the baseline, celebrating her second ITF team title in as many years. Congratulations to USTA coaches Kathy Rinaldi and Eric Nunez for their roles in putting US junior tennis at the top of the world today. For my post on the 2008 Junior Davis and Junior Fed Cup titles (ITF link no longer works), click here. Sandy Harwitt had quotes from the US boys in this article for the ITF junior website. The article with quotes from the US girls is here. The complete results from the competition are at the ITF tournament site. Ingrid Neel had to win seven matches just to reach the final of the $10,000 Amelia Island Pro Circuit event--three in qualifying and four in the main draw--but she didn't have to play a full eighth. Unseeded wild card Edina Gallovits-Hall of Romania retired at 4-4 in the first set of the rain-delayed final to give the 16-year-old from Minnesota her first title at that level. At the $10,000 Irvine Futures, No. 2 seed Dennis Nevolo won his second Futures title in three weeks, defeating 2014 NCAA finalist Alex Sarkissian(Pepperdine) 6-7(17), 7-5, 6-3. The first set was nearly 90 minutes long with that amazing tiebreaker, but the former Illinois All American recovered, not only from that disappointment, but from failing to serve out the set at 5-3 in the second set to get the win. He converted 6 of 8 break point chances to deny the seventh-seeded Sarkissian his second title of the year. Top seed Sam Querrey and No. 4 seed Madison Brengle finished an excellent day for American tennis by capturing $50,000 tournament titles in Napa Valley and Las Vegas. Querrey defeated No. 2 seed Tim Smyczek 6-3, 6-1, and Brengle downed Portugal's Michelle Larcher de Brito 6-1, 6-4. Querrey's win will put him back in the ATP top 50, and Brengle should crack the WTA Top 100 for the first time with her title. 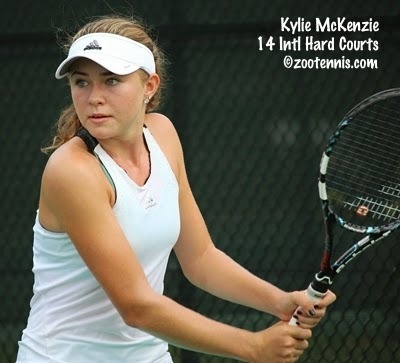 The ITF Grade 5 in Waco, Texas wrapped up today, with Kylie McKenzie and Ryan Storrie winning titles. 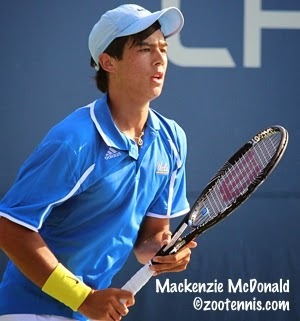 The 15-year-old McKenzie, the current National 16s champion, was seeded No. 14, but she lost only one set in her six victories, and in the semifinals and final, dropped only two games total. In today's final, the Arizona resident defeated No. 6 seed Abigail Desiatnikov, a wild card entry, 6-2, 6-0, claiming her second ITF singles title. 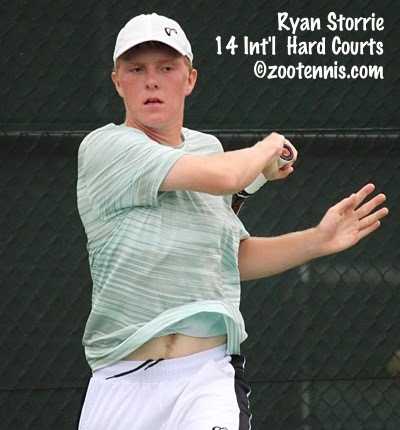 The 16-year-old Storrie, who is from Great Britain but trains in Southern California, was seeded 15th, but he too lost only one set en route to his first ITF title. Storrie defeated qualifier Joshua Sheehy 6-4, 6-1 in today's singles championship match. No. 2 seeds Kayla Day and Alexandra Sanford won the girls doubles title, beating No. 6 seeds Emerald Able and Jada Hart 4-6, 7-5, 13-11. The boys doubles title went to Sheehy and his partner Parker Wynn, with the unseeded team defeating No. 2 seeds Vasil Kirkov and Trent Bryde 6-4, 4-6, 12-10. In other ITF finals involving American juniors, No. 3 seed Madison Bourguignon lost in the championship match at the ITF Grade 2 tournament in Uruguay. She was beaten by No. 5 seed Julieta Estable 6-2, 7-6(2). 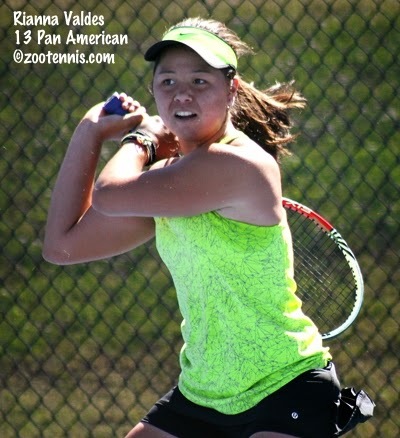 At the Grade 5 in Puerto Rico, unseeded 15-year-old Victoria Emma defeated fellow unseeded American Nami Otsuka 7-6(6), 6-0 in the final, picking up her first ITF singles title. Emma won the doubles title too, with she and Elene Tsokilauri defeating top seeds Natalia Barbery of Bolivia and Sofia Munera Sanchez of Colombia 4-6, 6-2, 10-3. The boys singles champion, Jake Gabay, also swept the titles in Puerto Rico. Gabay, seeded No. 5, defeated unseeded Robert Loeb 6-2, 6-2 to win the singles title. He also teamed with Gabriel Pilones to take the doubles title, with the top seeds defeating No. 2 seeds Boris Kozlov (Stefan's younger brother) and Franz Luna Lavidalie of Guatemala 7-5, 6-4. Sixteen-year-old qualifier Ingrid Neel moved into the final of the $10,000 Amelia Island tournament, defeating No. 6 seed Emma Flood of Norway 6-3, 1-6, 6-2. Neel, who is playing in her first final at the Pro Circuit level, will meet 29-year-old wild card Edina Gallovits-Hall of Romania, who beat US Open girls champion Marie Bouzkova of the Czech Republic 2-6, 6-2, 6-3. 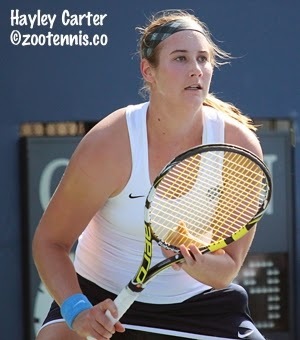 It is Gallovits-Hall's first final since April of 2012, when she lost to Camilia Giorgi of Italy in the championship match of the $50,000 tournament in Dothan, Alabama, but she hadn't played at all since January of 2013 before her appearance this week. The doubles title went to top seeds Keri Wong(Clemson) and Maria-Fernanda Alves of Brazil, who beat teenagers Sophie Chang and Andie Daniell 7-6(6), 7-6(4) in today's final. At the $50,000 Napa Valley Challenger, top seed Sam Querrey and No. 2 seed Tim Smyczek will meet in Sunday's final. Querrey downed unseeded Alex Bolt of Australia 6-2, 6-3 and Smyczek ended the run of Jared Donaldson, beating the 17-year-old 3-6, 6-4, 6-3. In Las Vegas, No. 4 seed Madison Brengle will play for the title of the $50,000 Red Rock Open after her 6-2, 6-4 win over qualifier Kateryna Bondarenko of Ukraine in today's semifinals. Brengle will face No. 8 seed Michelle Larcher de Brito of Portugal, who stopped the winning streak of No. 3 seed Anna Tatishvili with a 6-3, 7-5 victory in the semifinals. The final of the $10,000 Futures in Irvine, California will feature two former collegiate All-Americans in No. 2 seed Dennis Nevolo(Illinois) and No. 7 seed Alex Sarkissian(Pepperdine). Nevolo defeated No. 6 seed Greg Jones of Australia 7-6(5), 6-2 and Sarkissian ousted top seed Jason Jung(Michigan) 6-3, 6-1. I hadn't spoken to Nicole Gibbs since she won the NCAA singles title back in 2013, so I made sure not to miss the opportunity to catch up with her at this year's US Open, where she made the third round as a wild card. Although she was obviously disappointed to have lost her match to Flavia Pennetta an hour or so earlier, she gave her usual thoughtful and candid answers to my series of questions about her first 15 months on the WTA tour. She also had some strong words against the format changes proposed in Division I tennis. 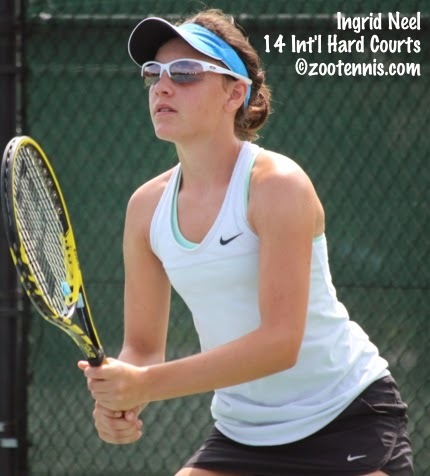 The full interview is available today at the Tennis Recruiting Network. At the Junior Davis Cup and Junior Fed Cup competition in San Luis Potosi Mexico today, both teams from the United States advanced to Sunday's finals, again by the scores of 3-0. Against No. 4 seed Russia, Tornado Alicia Black took the first point, defeating Anna Blinkova 6-3, 6-0 at No. 2 singles. CiCi Bellis secured the victory at No. 1 singles, but it wasn't easy for the ITF World No. 1. She led Anna Kalinskaya 6-1, 4-2 only to see Kalinskaya win five of the next six games to force a third set. Up a break at 3-2 in the third set, Bellis was broken in a four-deuce game, but that would be the last game she would lose, as she won the final three games for a 6-1, 5-7, 6-3 victory. Bellis, who anchored the US team that won the 14-and-under ITF World Junior Tennis team competition last year, has not played doubles, with Black and Sonya Kenin getting that duty. The doubles point has not been necessary in any of the top seed's four wins, but they won it again today, beating Blinkova and Aleksandra Pospelova 6-2, 6-3. The girls will play unseeded Slovakia in the final. Slovakia ousted No. 2 seeds Hungary 2-1, with Tereza Mihalikova defeating Dalma Galfi and Viktoria Kuzmova downing Fanni Stollar in singles. The No. 2 seeded boys team won over No. 3 Japan, with William Blumberg beating Shohei Chikami 6-2, 6-3 at No. 2 singles for the first point, and, at No. 1 singles, Michael Mmoh defeating Renta Tokuda 6-2, 6-2 to clinch the win. Blumberg and Gianni Ross won the superfluous doubles point, beating Chikami and Riki Oshima 7-5, 1-6, 6-1. Ross was on the ITF World Junior Tennis team that lost 2-1 in the final to Russia last year. The US boys will play No. 4 seed Korea in the final, after the 2013 Junior Davis Cup finalists defeated top seed France 2-1. Chan-Yeong Oh and Yunseong Chung won both singles matches, with France salvaging the doubles point. Chung and Mmoh will now have a rematch of their first round US Open match earlier this month, which Chung won over the No. 10 seed, 4-6, 6-3, 7-6(5). Blumberg had the shot of the day on match point against Chikami, below. For complete results from today's Junior Davis Cup and Junior Fed Cup matches, see the ITF tournament page. In Pro Circuit action today, Jared Donaldson reached the semifinals of the $50,000 Napa Valley Challenger, defeating qualifier Julian Lenz of Baylor 7-6(4), 6-3. He will play No. 2 seed Tim Smyczek, who beat Liam Broady of Great Britain 6-1, 6-1. Sam Querrey, the top seed, will meet Alex Bolt of Australia in the other semifinal. After Donaldson's win over Wayne Odesnik, Paul Bauman conducted a lengthy interview with Donaldson for this blog post. At the Amelia Island $10,000 women's event, 16-year-old qualifier Ingrid Neel has reached the semifinals, defeating No. 5 seed Ellie Halbauer 6-2, 5-7, 6-3. Neel will play No. 6 seed Emma Flood of Norway for a place in the final. US Open girls champion Marie Bouzkova of the Czech Republic will face 29-year-old wild card Edina Gallovits-Hall of Romania in the other semifinal. Gallovits-Hall has a WTA career-high ranking of 54 back in 2008. Teens Sophie Chang and Andie Daniell will play for the doubles title against top seeds Maria-Fernanda Alves of Brazil and Keri Wong (Clemson). Jennifer Brady's run at the $50,000 Las Vegas tournament came to an end today, as the unseeded wild card lost in the quarterfinals to No. 3 seed Anna Tatishvili, who won the Albuquerque $75K last week. Brady served for the match at 5-3 in the third, but Tatishvili came back, winning the final four games for a 6-3, 3-6, 7-5 victory. No. 4 seed Madison Brengle defeated Nicole Vaidisova of the Czech Republic, returning from a four-year break from the game this month, 6-4, 6-3 to also reach the semifinals. At the Irvine $10,000 Futures, top seed Jason Jung(Michigan) will play No. 7 seed Alex Sarkissian(Pepperdine) in one semifinal and unseeded Greg Jones of Australia will play No. 2 seed Dennis Nevolo(Illinois). Jones defeated 16-year-old Taylor Fritz 7-6(3), 7-6(1) in the quarterfinals today. Jones picked up the doubles title with Greg Ouellette(Florida), with the pair defeating Carsten Ball and Junior Ore(Texas A&M) 6-2, 4-6, 10-5. The top-seeded US girls and second-seeded US boys had no difficulty advancing to Friday's Junior Fed Cup and Junior Davis Cup semifinals, with both teams posting 3-0 victories. The girls breezed past No. 6 seed Belarus, with Tornado Alicia Black defeating Aryna Sabalenka 6-1, 6-2 at No. 2 singles and CiCi Bellis downing Ulyana Grib by the same score at No. 1 singles. Black and Sonya Kenin then completed the sweep with a 6-3, 6-1 win over Sabalenka and Grib in the doubles match, finishing atop round robin Group A. Bellis, by the way, has withdrawn from the upcoming ITF Grade B1 Pan American Closed. The US team's opponent in the semifinals will be No. 4 seed Russia, who swept through Paraguay to finish undefeated in Group B. Unseeded Slovakia will play No. 2 seed Hungary in the other Junior Fed Cup semifinal. The boys had a more difficult time with No. 8 seed Germany, but managed to win all three hard-fought matches. William Blumberg defeated Valentin Guenther 6-4, 4-6, 6-2 at No. 2 singles to give the US a 1-0 lead and Michael Mmoh clinched the match with a 6-2, 7-6(1) win at No. 1 singles over Louis Wessels. Blumberg and Gianni Ross then downed Guenther and Tim Ruehl 3-6, 6-2, 6-3 in the doubles competition. The US will play No. 3 seed Japan in the Junior Davis Cup semifinals after Japan took the doubles point from No. 5 seed Argentina to record a 2-1 victory. No. 4 seed Korea will play top seed France in the other JDC semifinal. Today's results can be found at the ITF tournament page. 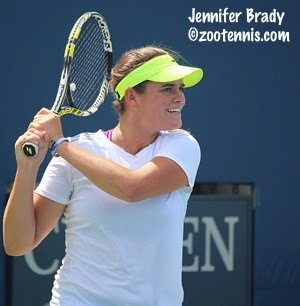 Jennifer Brady's excellent September continued today, with the UCLA sophomore, who is taking the fall off to compete in professional events as an amateur, moving into the quarterfinals of the $50,000 Las Vegas Pro Circuit event. Wild card Brady, who won the $25,000 tournament in Redding, California two weeks ago, defeated No. 6 seed and WTA No. 124 Melanie Oudin 7-6(6), 7-6(3) and is now 7-0 in Pro Circuit events this month. She will play No. 3 seed Anna Tatishvili, who downed Irina Falconi (Georgia Tech) for the second time in five days. Qualifier Ema Burgic of Baylor saw her run end in the second round, but No. 8 seed Michelle Larcher de Brito of Portugal needed a third set tiebreaker to do it. Larcher de Brito won the match 3-6, 6-3, 7-6(5). At the Amelia Island $10,000 women's tournament, Ingrid Neel defeated fellow 16-year-old qualifier Nicole Frenkel 7-6(4), 6-2 to advance to the quarterfinals. Other young Americans to reach the final eight are No. 5 seed Ellie Halbauer and USC recruit Rianna Valdes. US Open girls champion Marie Bouzkova of the Czech Republic defeated No. 2 seed Maria-Fernanda Alves of Brazil 6-2, 6-4 and will play Valdes next. Valdes won their previous meeting at the $10K in Orlando this past spring, with Bouzkova trailing 6-0, 3-1 when she retired. The only junior remaining in the $10,000 Irvine Futures is wild card Taylor Fritz, who reached his second career Futures quarterfinal with a 6-3, 7-6(3) victory over No. 3 seed Jeff Dadamo(Texas A&M). Stefan Kozlov lost to Kyle McMorrow(Washington) 6-1, 6-4. Illinois senior Farris Gosea, who won the $15,000 Futures in Canada last week, kept his winning streak going with a 7-5, 6-0 win over Sebastian Rivera of Ecuador. Gosea will play NCAA finalist Alex Sarkissian(Pepperdine), the No. 7 seed, in Friday's quarterfinals. The Junior Fed Cup and Junior Davis Cup teams from the United States will play for semifinal berths on Thursday in San Luis Potosi Mexico after both posted 3-0 victories over their opponents in the second of three round robin matches. 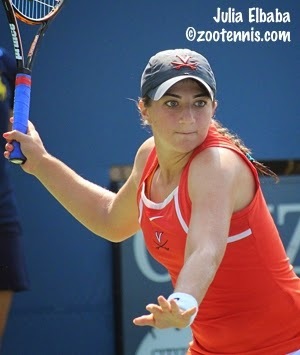 CiCi Bellis, Tornado Alicia Black and Sonya Kenin lost only two games total in three matches against Peru, with Black losing both in her singles match. The top seeds will play No. 6 seed Belarus Thursday, with the winner advancing to the semifinals. William Blumberg and Michael Mmoh won their singles matches against Bolivia in straight sets, with Mmoh and Gianni Ross completing the sweep with a 6-2, 6-0 win in doubles. The No. 2 seeds play No. 8 Germany on Thursday and will advance to the semifinals with a win. Except for No. 3 girls seeds France, which is 0-2 after a loss to No. 7 seed Japan today, the top four seeds in each division remain in contention to reach the semifinals. Complete results from today can be found here. The Grade 5 ITF tournament in Waco this week, the start of the fall ITF swing in the United States is down to the quarterfinals. Neither of the top seeds are still alive, and as is frequently the case with these lower grades, some unfamiliar names (to me at least) have popped up including 13-year-old Lea Ma and 17-year-old Joshua Sheehy, both unseeded quarterfinalists. 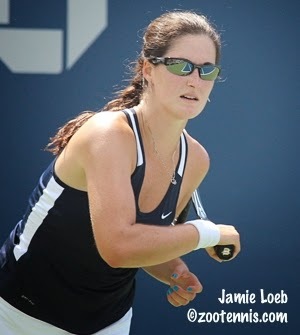 At the $10,000 Pro Circuit women's tournament in Amelia Island, Florida, qualifier Ingrid Neel defeated top seed and WTA No. 368 Nathalia Rossi of Brazil 6-2, 6-4 to set up a second round encounter with fellow 16-year-old Nicole Frenkel, who also qualified. Frenkel defeated Anastasia Kharchenko of Ukraine 7-6(4), 6-3. Ellie Halbauer, qualifier Jessica Ho and US Open girls champion Marie Bouzkova of the Czech Republic also posted first round wins today. At the $50,000 Las Vegas women's tournament, qualifier Ema Burgic of Baylor reached the second round, with the senior from Bosnia defeating WTA No. 170 Gioia Barbieri of Italy 6-4, 6-0. Jared Donaldson, who will be 18 next month, reached his first Challenger level quarterfinal today with a win over Wayne Odesnik in the $50,000 Napa Challenger. Donaldson was leading 6-2, 3-1 when Odesnik retired with an ankle injury. Next up for the 2013 Kalamazoo finalist is Baylor junior Julian Lenz, who defeated qualifier Daniel Nguyen(USC) 7-6(4), 6-2. The ITA preseason No. 1 is also making his first appearance in a Challenger quarterfinal. And at the €106,500 Challenger in Orleans France, former Auburn All-American and 2010 NCAA semfinalist Tim Puetz of Germany picked up the biggest win of his career. Puetz, currently at 210 in the ATP rankings, beat No. 24 and top seed Philipp Kohlschreiber of Germany 7-6(3), 6-1 in the first round today. Puetz will play another German, Dustin Brown, in Thursday's second round. Rain has delayed the completion of today's first of the round robin matches at the Junior Davis Cup and Junior Fed Cup competition in San Luis Potosi Mexico. According to this update on the ITF Junior site, the first matches began three hours late, and the rain made other appearances in the afternoon, although according to the ITF tournament page, Tornado Alicia Black did complete her first round singles match against Shu Yue Ma of China, winning it 6-0, 6-2. (The live scoring, which is supposed to be here, isn't working for me.) The US boys were playing Taiwan, and William Blumberg won his match over Chien-Hsun Lo 7-5, 6-2. The tournament page shows Michael Mmoh winning 3-0, ret. over Tung-Lin Wu. Live streaming is showing the Junior Davis Cup tie between Mexico and Korea still going, so perhaps the results on the tournament page will be updated in the next few hours. At the Porsche Napa Valley Tennis Classic, the Solinco Wild Card Shootout was won by Sebastian Beltrame of Harvard, who beat teammate Nicky Hu 10-4 to win a main draw wild card into a Pro Circuit event. Beltrame, a sophomore, went undefeated in the three-day event. For complete results from the tournament, see this pdf from the Cal website. 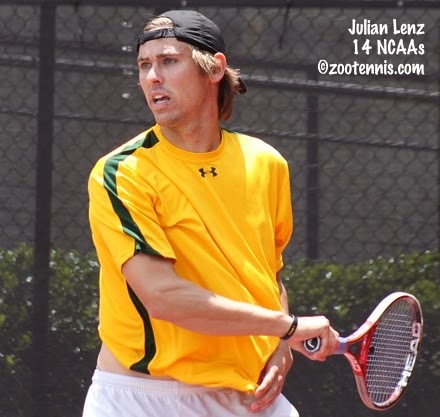 Baylor's Julian Lenz continued his excellent run at the $50,000 Napa Challenger, winning his first round match after posting three qualifying wins the previous three days. The ITA preseason No. 1, a junior from Germany, defeated former ITA No. 1, Australia's JP Smith of Tennessee, 6-3, 2-6, 6-4 to advance to a second round match against former USC standout Daniel Nguyen. Nguyen, who also qualified, upset No. 8 seed Frank Dancevic of Canada 6-3, 6-7(6), 6-3. For more on Lenz's win, see this from the Baylor website. 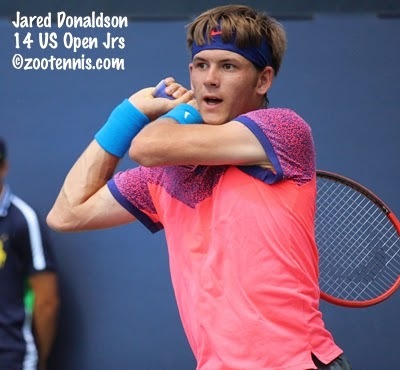 Jared Donaldson defeated Ryan Harrison 6-3, 7-5 to advance to the second round, joining top seed Sam Querrey, Rhyne Williams(Tennessee), Dennis Novikov(UCLA) and 18-year-old Elias Ymer of Sweden. NCAA champion Marcos Giron lost to No. 3 seed Marcos Baghdatis of Cyprus 6-3, 6-2. Another Baylor athlete doing well on the professional level this week is senior Emma Burgic of Bosnia, who has qualified for the $50,000 women's Pro Circuit tournament in Las Vegas. Burgic defeated WTA No. 292 Tatjana Maria of Germany 6-2, 7-6(4) in today's third round of qualifying. Jennifer Brady of UCLA, who received a wild card into the main draw, continued her hot streak, beating Amandine Hess of France 7-6(1), 4-6, 6-3 in the first round. The $10,000 Amelia Island women's tournament also had rain disruptions today, but Caroline Dolehide and Andie Daniell were among the first round winners there. 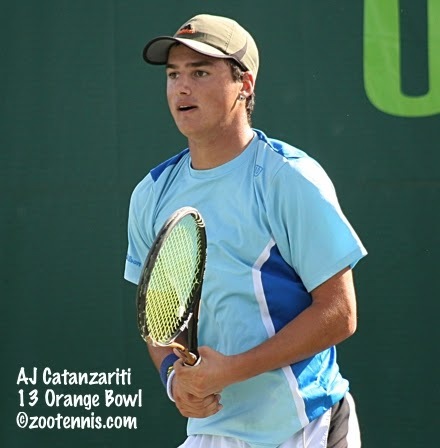 At the $10,000 Irvine Futures, 2014 NCAA finalist Alex Sarkissian(Pepperdine), Stefan Kozlov, Deiton Baughman, Taylor Fritz, Gage Brymer(UCLA) and Lucas Gomez of Mexico won first round matches. Sarkissian, seeded No. 7, was the only seed to play today, with the other seven scheduled for Wednesday. The Junior Davis Cup and Junior Fed Cup teams from the United States have been cast in the role of favorites for the competition, which begins tomorrow in San Luis Potosi Mexico. The USA's Junior Fed Cup team of CiCi Bellis, Tornado Alicia Black and Sonya Kenin is seeded No. 1, with Hungary, France and Russia also expected to win their round robin groups and advance to the semifinals. The USA's Junior Davis Cup team of Michael Mmoh, Gianni Ross and William Blumberg is the No. 2 seed, behind France, with Japan and Korea projected to win their groups and reach the semifinals. For more on the seeds, see this article from the ITF junior website. The competition is also going to be live streamed for the first time, with that option available here. I mentioned by in the summer that Vicky Duval had been diagnosed with Hodgkin's lymphoma and would be undergoing treatment. She has been tweeting about her treatments and condition for the past two months, and announced over the weekend she is now cancer free. For more, see the WTA website. The qualifying is complete at the $50,000 Napa Challenger and ITA preseason No. 1 Julian Lenz of Baylor has made the main draw. Lenz won three matches the past three days, all of them in straight sets, beating Mico Santiago 6-2, 6-1 in today's final qualifying round. Live streaming for Napa and for the $50,000 women's event this week in Las Vegas can be found here. I spent the morning at the Division III women's central regional final, where Washington University-St. Louis sophomore Rebecca Ho defeated University of Chicago freshman Ariana Iranpour 7-5, 6-2 to earn her place in the ITA Small College National Championships next month in Sumter, South Carolina. Iranapour led 5-3 and had a set point in the first set with Ho serving at 3-5, but Ho held and won the next seven games before Iranapour recovered. "She's a really tough opponent, so I knew I had to raise my level," said Ho, the No. 4 seed. "And as time went along I was able to do that." Trailing 3-0 in the second set, Iranpour held and broke, but she couldn't pull even, losing her next service game. "I started getting really nervous when that happened," said the Santa Clarita, California resident. "She was upping her game too, so I knew I had to really dig in and try really hard the next few games to pull it out." Ho was playing with the index finger on her left hand wrapped after dislocating it in a fall during a doubles match earlier in the month. "I thought it was really going to affect my play, but actually there was almost no effect at all," Ho said. "I know that it's there but I knew I had to work around it and I was able to do that." Ho was not even sure where the Small College National Championships are being held. "I thought I'd get through this match and then I'll think about it," Ho said. Iranpour didn't leave Kalamazoo without a title however, as she and Megan Tan won the doubles title on Saturday. For the complete draws, see the Kalamazoo College website. For an update on other regionals around the country, see the ITA's hub page. In other college fall tournament news, Wayne Montgomery of Georgia has begun his collegiate career with a bang, winning both the Southern Intercollegiate Championships last weekend and yesterday, the Cajun Classic. 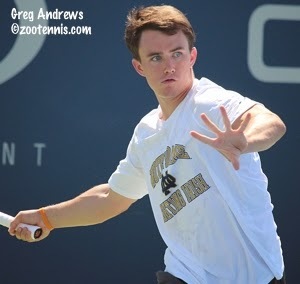 He will have to go through qualifying to get into the All-American Championships main draw however, as it doesn't appear any of the freshmen/newcomers received a wild card, as has been granted in the past. At the men's SEC Classic in Gainesville, all four of the semifinalists were Gators, with sophomore Elliott Orkin taking the title. Orkin, Gordon Watson and Maxx Lipman, two other semifinalists, are all in the qualifying tournament at the All-American Championships. Diego Hidalgo, who Orkin defeated in the finals today, is in prequalifying. Croatia's Borna Coric, who won't turn 18 until November, won his first Challenger title today in Turkey, defeating top seed Malek Jaziri of Tunisia 6-1, 6-7(7), 6-4 in the final of the €106,500 tournament. 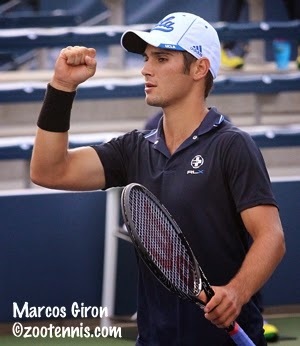 The 2013 US Open boys champion showed some mental toughness in the third set after letting five match points slip away in the second set, including a 6-3 lead in the tiebreaker. Josh Meiseles, who it the ATP's resident Challenger expert, reports in this article that this is one of just four years when more than one 17-year-old has won a Challenger (Alexander Zverev of Germany is the other this year). 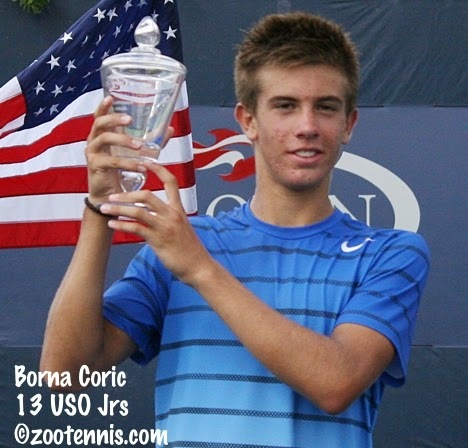 Coric is one of five teenagers to win a Challenger this year joining Nick Kyrgios of Australia, Yoshihito Nishioka of Japan, Hyeon Chung of Korea and Zverev. With the title Coric will break into the ATP Top 150. While one junior grand slam champion is moving into the spotlight, another is walking away from it. Australia's Ashleigh Barty, who won the Wimbledon girls title in 2011 and reached three senior slam finals in doubles last year, is leaving the game, according to this article in the Sydney Morning Herald. Only 18, Barty has not given any time frame for a return, saying in a statement only that "it is best for me to take a break from professional tennis." 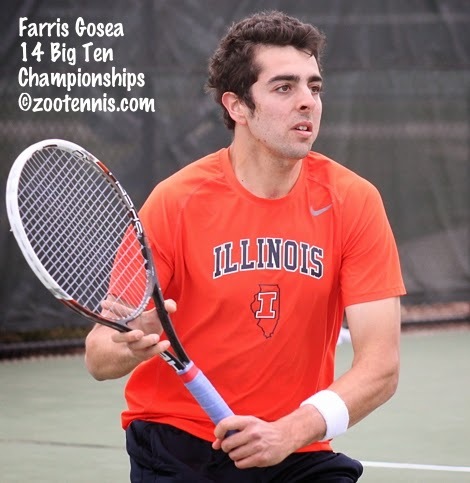 University of Illinois senior Farris Gosea won his first title on the ITF men's circuit today at the $15,000 Futures in Canada. Gosea, who is from Wales and competes under the Great Britain flag, defeated No. 6 seed Phillip Bester of Canada 7-6(8), 3-6, 6-4. For more on Gosea's victory, see this article from the University of Illinois website. 2013 NCAA singles finalist and doubles champion Jarmere Jenkins won his third Futures title, defeating Dennis Novikov, formerly of UCLA, 6-4, 6-2 in the $10,000 event in Costa Mesa, California. Novikov had beaten Jenkins in their previous meeting in a Futures final last summer, but the former Cavalier won a rematch the following week in the quarterfinals, and including the NCAA team finals in 2013, is now 3-1 against Novikov. Jenkins earned $1,440 for the victory and will pick up 17 points toward his world ranking. He entered the event ranked 280th in the world. The next five weeks, his focus with be playing Futures events in Australia. “The circuit in America is usually the top American players beating up on each other, so it’s good to get away and see different players in a new atmosphere,” Jenkins told Beers. The title will no doubt help Jenkins feel a little bit better about this fall, which took place yesterday in his semifinal match with Tennys Sandgren. Jenkins linked to it on his twitter account, and ESPN has noted it for its Not Top Ten feature. Former Texas A&M player Junior Ore and former San Diego State player Jeremy Hunter Nicholas won the doubles title in Costa Mesa, defeating current UCLA teammates Mackenzie McDonald and Martin Redlicki 4-6, 6-4, 10-8. At the $75,000 women's Pro Circuit event in Albuquerque, top seed Anna Tatishvili defeated Irina Falconi 6-2, 6-4 in the singles final. Melanie Oudin and Jan Abaza won the doubles title, defeating No. 4 seeds Nicole Melichar and former Gator All-American Allie Will 6-2, 6-3. The USTA has again sent a boys team to the Porsche(formerly Land Rover) Napa Valley Tennis Classic at Meadowood Resort, but before they competed against players from Tulsa, Stanford, Cal, North Carolina, Texas and Harvard, they played the Cal men's team, falling to the Bears 8-4 on Wednesday. The juniors competing in Berkeley and in Napa are Kalman Boyd, Walker Duncan, Jacob Brumm, Sam Riffice, Connor Hance, Timothy Sah, Sameer Kumar and Alfredo Perez. Neither Steve Pratt nor I am in Napa covering the event this year, but results are available on the Cal website. In addition to the college/junior event in Napa, the qualifying has begun for next week's Challenger. In one of the intriguing first round qualifying matches today, preseason No. 1 Julian Lenz of Baylor defeated Kalamazoo and Wimbledon boys champion Noah Rubin 6-4, 6-2. Spencer Papa won his first round qualifying match today, as did former USC star Daniel Nguyen (over Tommy Paul) and Oklahoma Sooners Dane Webb and Andrew Harris. Sam Querrey, who received a wild card, is the top seed in the $50,000 event, with other wild cards going to NCAA champion Marcos Giron,(UCLA) Giron's former teammate Dennis Novikov, and former three-time NCAA D-III singles champion Matt Seeberger (UC-Santa Cruz). Denis Kudla is back after being out for two months with mono. Novikov today reached the finals of the $10,000 Costa Mesa Futures, defeating Jeff Dadamo (Texas A&M) 3-6, 6-4, 6-3. Former Bruin Novikov, the No. 5 seed, will play No. 2 seed Jarmere Jenkins, the 2014 NCAA finalist while at Virginia. Jenkins saved a match point at 5-6 in the third set tiebreaker to defeat Tennys Sandgren(Tennessee) 5-7, 6-4, 7-6(6). Sunday's Costa Mesa final will be a rematch of the contest at No. 1 singles in the 2013 NCAA Team Championships, which Jenkins won 7-6(3), 6-3. The final at the $75,000 women's Pro Circuit event in Albuquerque will also feature two Americans, with Irina Falconi(Georgia Tech) facing top seed Anna Tatishvili. In today's semifinals, Falconi beat 18-year-old Louisa Chirico 6-3, 7-6(5) and Tatishvili defeated No. 3 seed Johanna Konta of Great Britain 4-6, 6-3, 7-6(3). University of Illinois senior Farris Gosea of Great Britain has reached his first Futures final at the $15,000 tournament this week in Canada. The unseeded Gosea beat top seed Jason Jung (Michigan) 7-5, 4-6, 6-4 in today's semifinal, and will face No. 6 seed Philip Bester of Canada in Sunday's final. The doubles title went to Seeberger and his partner Rudy Siwy, the former Fresno State star and current Santa Clara men's assistant coach. The top seeds defeated No. 3 seeds Filip Peliwo of Canada and Daniel Skripnik of Israel 6-2, 6-3 in the final. My recap of the first American Collegiate Invitational is up today at the Tennis Recruiting Network. After talking with tournament director Bill Mountford and US Open tournament director David Brewer, it sounds as if will be back in 2015, with some tweaks, of course. As I mentioned in my post last week on how top college players feel about the no-ad format, I talked to all 16 competitors at the American Collegiate Invitational two weeks ago. So instead of a slide show, I'm passing along individual photos with a brief update on their plans for the coming months. Andrews is currently working on a masters in accounting at Notre Dame, but will train with the team, and continue play when he can, saying he's not ready to give it up. The sophomore at UCLA returns to school in October after playing 10 events this summer. McDonald, 13 in the preseason rankings, reached the semis of the Winnetka Challenger and Tulsa Futures and will play the Napa Challenger next week. 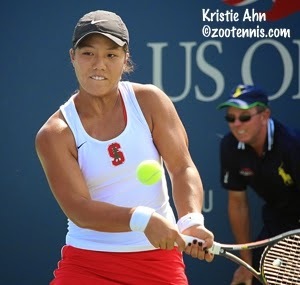 Ahn, who graduated from Stanford with a degree in Science, Technology and Society, is now training in Boca Raton, although not with the USTA. She plans to play professional tennis for at least a couple of years. 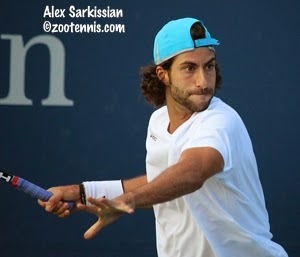 Sarkissian, the NCAA finalist in 2014, won a Futures title in Canada this summer. The Pepperdine graduate plans to compete on the professional circuit full time. The 2014 NCAA champion, a junior at Virginia, is No. 10 in the preseason rankings. She had wrist surgery after the NCAAs, returning to competition in August and winning a set from WTA No. 2 Simona Halep in the first round of the US Open. The Virginia junior is No. 5 in the preseason rankings and expressed excitement about the upcoming ITA Riviera All-American Championships, where she reached the final as a pre-qualifier her freshman year. She plans to play Pro Circuit events this fall as well. The Ohio State graduate is currently in Sweden, where he has reached the final of a Futures there. He has won 5 doubles titles since starting his pro career in June, all outside the US, and said he has enjoyed the extensive traveling he's done. No. 1 in the preseason rankings, the North Carolina sophomore is playing the ITA Riviera All-American championships and the Las Vegas, Florence and New Braunfels Pro Circuit events. Says she definitely wants to turn pro, but has no timetable other than 'near future'. Now a pro after three years at UCLA, Giron is expected to sign a management agreement with the CAA agency soon. He is playing the Napa Challenger next week, and says he gained confidence from qualifying at August's ATP Winston Salem event. Former Gator Janowicz is dealing with a stress fracture in her foot, but if she heals sufficiently, she will give the professional tour a try. 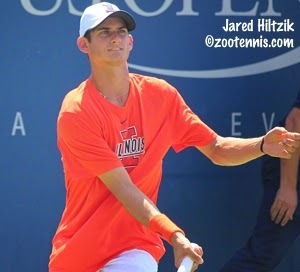 Hiltzik strained his hip flexor this summer, but is back healthy and ready for his junior season at the University of Illinois. His preseason ranking is 6. Since posting my article on what I'd like to see from USTA Player Development going forward, I've come across several others. This one, from New York magazine, "Ten Ways to Make the Next Great American Tennis Star" provides perspectives from a wide variety of people, including Jeff Tarango, Katerina Stewart, Mats Wilander and others. My esteem for The Talent Code: Greatness Isn't Born. It's Grown. Here's How. and its author Daniel Coyle, who wrote this perceptive piece on the value of "crummy" facilities, makes No. 3, on the new Lake Nona complex, particularly interesting to me. Tennis.com's Kamakshi Tandon provides thoughts on Player Development from the Bryan brothers, who spoke after the announcement that Patrick McEnroe was leaving his position as its General Manager. They confirmed their agreement with the above article's suggestion No. 7. "I mean, it's tough to hand pick kids and put them in a center and say they're going to all be champions. I think just the best chances are to let the coaches do their jobs." ".... So why not help out those coaches and those programs instead of taking kids out of their comfortable environment and sticking them in a center without their parents and trying to make them pros in an uncomfortable environment—these are formative years [for] teenagers and young adults." 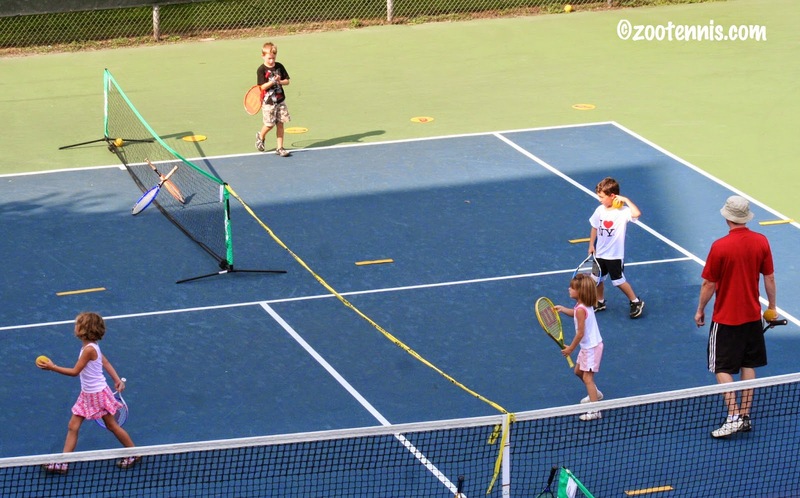 Before there was the firestorm of the recent Junior Competition restructuring, there was another unpopular USTA mandate, 10-and-under Tennis, formerly known as QuickStart. The New York Times recently looked at the program, how and why it was introduced, and the criticism it has faced since. "Saving parents from themselves" probably isn't a goal the USTA should voice publicly, even if they privately view that as one of their roles. And, although I tweeted a link to this several days ago, I don't think I posted it here. Francis Tiafoe, who has plenty of company as a bright American 16-and-under prospect, is the subject of this Grantland article, which revolves around the interest Jay Z's Roc Nation sports department has in signing him to a professional contract. The article also attempts to explain why Tiafoe is "the world's most famous junior tennis player," and the pressures he faces because of that. Having lived through Donald Young's junior career, I don't see the any good coming from Tiafoe being in this position, and I hope his peers can help deflect some of the attention. But just the fact that this article was written tells me that being famous only engenders more attention, that it's reason enough to put a microscope on a child and his family. I'm not so sure about that. The USTA announced the three-player teams that will represent the United States next week at the ITF's Junior Fed Cup and Junior Davis Cup competitions for 16-and-under players. As I mentioned on Monday, the girls team consists of CiCi Bellis, Tornado Alicia Black and Sofia Kenin and will be coached by Kathy Rinaldi. The boys team is Michael Mmoh, William Blumberg and Gianni Ross, and is coached by Eric Nunez. John McNally was originally named to the team, but a recent injury kept him from making the trip. The two teams are competing Friday against the University of New Mexico tennis teams at the new McKinnon Family Tennis Complex in Albuquerque, with three doubles matches, including one mixed doubles, followed by six singles matches. For more on the match, see the New Mexico website. Black, who qualified for the $75,000 Pro Circuit tournament in Albuquerque, won her first round match this evening, so her status for Friday's college match will depend on how she does in the pro tournament Thursday, when she takes on top seed Anna Tatishvili. I am still awaiting official word from the ITA on the status of the format change. But there's still college news to report, including the filling of the women's head coaching position at Texas. 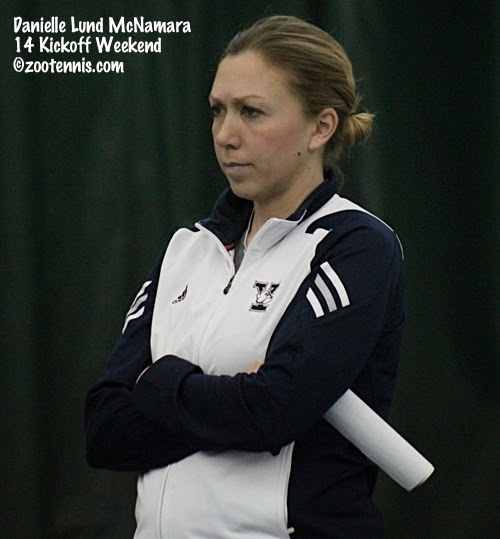 Danielle Lund McNamara, who coached last year at Yale, will take over for Patty Fendick-McCain, who retired in June. Former Ohio State All-American Ross Wilson has been named interim men's head coach at Iowa after the announcement this month that Steve Houghton, coach of the Hawkeyes for 33 years, would retire, effective immediately. Wilson was the assistant to Houghton last season. Ty Shaub, another former Buckeye, has been named interim assistant to Wilson. Another former Ohio State All-American, Bryan Koniecko, has been named men's head coach at Brown. Koniecko previously served as men's assistant at Brown in 2010-12 and was the women's assistant at Ohio State the following two seasons. Replacing Koniecko in Columbus is Adam Cohen. He was previously men's head coach at Binghamton. Cordell Ho has retired as women's assistant at Cal, with Zack Warren taking his place. Warren is a former player and men's assistant at Brigham Young. Courtney Nagle, previously an assistant at Iowa, replaces Sara Anundsen as women's assistant at North Carolina. Kurt Clemmons is joining new Washington women's coach Robin Stephenson as her assistant. 2013 NCAA finalist Mary Weatherholt(Nebraska) has taken a women's volunteer assistant's position at TCU. Former Michigan men's coach Bruce Berque has taken a men's volunteer assistant position at Texas. The announcement of Paul Goldstein's hiring at Stanford came back in June, but here's a good interview with Goldstein as he begins his first season as Cardinal men's head coach. There are two significant questions related to USTA Player Development that I'm going to skip over in this post. The first is the governing structure of the USTA itself, which I discussed last week. The second is whether the position of General Manager of Player Development is one that needs to exist at all. But assuming it is going to be filled and the new hire in the position will be reporting to the new president and board of directors, I'll proceed with what I think has been accomplished in McEnroe's six years at Player Development, what needs to change to improve its effectiveness and what skills and experience the new General Manager should possess. I ask that you remember that I am not a coach, a parent, a player or a tournament director who has any direct contact with Player Development's policies and decisions. I talk regularly with all of those people at high-level junior tournaments, but my views are from the perspective of a journalist, not a "customer." I will say again what I have said for the decade I have been covering junior tennis for this website--all of us want the same thing: a strong and viable American presence in the global world of tennis. 4. Recognition that some private sector coaches who develop national-level players but are not famous have wisdom to offer. 1. PD allowed the USTA junior competitive structure be radically altered without advocating for the best interests of elite national players. PD has long recognized the various development paths, but has consistently abandoned its own system as a viable means of providing top-level competition. This goes not just for the tournament structure but the ranking system as well. When your federation's ranking system is not trusted by college coaches nor understood by those who are competing in the system, it has failed. 2. PD's voice must be heard on the topic of minimum prize money for Futures events on the USTA Pro Circuit. To allow $10,000 Futures tournaments to continue to exist without any increase in prize money for 20 years demonstrates a lack of big-picture thinking. It would cost $115,000 to upgrade the 23 men's $10Ks to $15Ks. A less complicated and cheaper action item would be hard to find. 3. Too much money is going to too few juniors. Selecting prospects is what competition is for. Anointing players based on potential and providing them with everything is risky at best and a waste of PD resources at worst. Better to give 100 kids $1000 than 1 kid $100,000. 4. USTA tournament fees are too high. $120 for a top USTA event vs $65 for a top ITF event (which unlike the USTA, provides hospitality) doesn't make any sense. If that gap can be justified, provide a breakdown of where the tournament fee dollars go. Adequate, well-trained officials should be the top budget priority. Earmark funds to that end if necessary. 5. There's not enough USTA PD presence at National/sectional tournaments and major college events. This is not a reference to the national coaches who travel with USTA players (see below), but to those in PD who do not have responsibility for specific players. They should be at as many tournaments as possible, representing the USTA and listening to tournament directors, players, parents and coaches. 6. 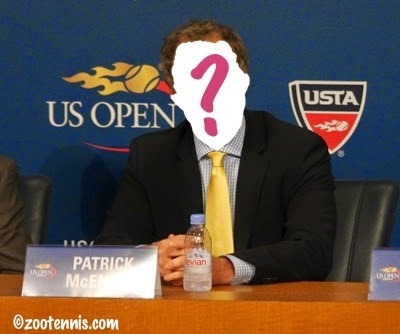 Team USA, the recent initiative to view all American players as part of the USTA, is sabotaged by the presence of USTA National Coaches as private coaches for "their" players at tournaments. It's only natural they want to see the players they are coaching daily in competition, but should a federation aim to have it both ways? Seeing three or four PD employees at the match of one junior they work with, and none at the majority of matches featuring American juniors, sends the wrong message to everyone, widening a gulf they maintain they want to close. 7. The emergence of social media has provided all organizations, big and small, a means to quickly and cheaply disseminate information and engage its constituency. Player Development has failed to take advantage of this opportunity to reach out to parents, players, coaches and fans. 8. Town meetings, webinars and focus groups are valuable, but if the USTA does not regularly and clearly communicate what it has heard and what it intends to do about what it has heard, it does little but feed the cynicism many feel. The USTA will always be a target for anything and everything that goes wrong in junior tennis in this country. That cannot blind it to reality that some criticism has merit, suggestions from the field are often valuable and its power has genuine consequences. It's very unlikely any one person would fit in that box, and I've probably missed other important aspects of the job, simply because I don't know what it has been or am failing to imagine what it could be. But if you have other ideas on how the USTA could improve Player Development, pass them on. It does matter. Although I haven't received the confirmation I've requested from the ITA, I have heard today's operating committee conference call resulted in a decision to continue to play the no-ad format throughout the fall, including at both ITA majors. My understanding is that there were three votes taken: for no-ad in doubles (same format as ITF, ATP, WTA) and regular scoring for singles; no-ad in some situations, but not all; and no-ad as originally approved, for both singles and doubles. When I hear back from the ITA, who has characterized this process as open and transparent one, I will provide the breakdown on each vote, but I do know there were four coaches who voted against the no-ad as currently adopted: Lin Loring(Indiana women), Brian Kalbas(North Carolina women), Brian Boland (Virginia men), and John Roddick(Oklahoma men). How this impacts the dual match season, I don't know now, but I hope to learn when the ITA provides more information. In junior news, Sofia Kenin is in Albuquerque, preparing for the altitude of San Luis Potosi Mexico, where the Junior Fed Cup will be held later this month. In qualifying for the $75,000 tournament there, the 15-year-old Floridian defeated No. 2 seed Maria Sanchez(USC) 6-3, 3-6, 6-3 today, and will qualify if she can defeat Nicole Melichar on Tuesday. CiCi Bellis, also representing the USA in Junior Fed Cup, lost to Stanford sophomore Carol Zhao 7-5, 6-4. The third member of the Junior Fed Cup team, Tornado Alicia Black, had not completed her second round match against top qualifying seed Sanaz Marand(UNC). After the US Open, the Junior Fed Cup and Junior Davis Cup, which begin a week from tomorrow, take center stage on the ITF junior calendar. But lower level tournaments continue, with the Grade 2 in Canada drawing many of the international players who were in New York for the junior championships. No. 7 seed Destanee Aiava of Australia, who lost in the first round of qualifying to Johnnise Renaud, won the girls singles in Canada, defeating No. 3 seed Kimberly Burrell, also of Australia, 7-6(3), 6-2 in the final. Aiava, 14, defeated top seed Iryna Shymanovich of Belarus in the quarterfinals. No. 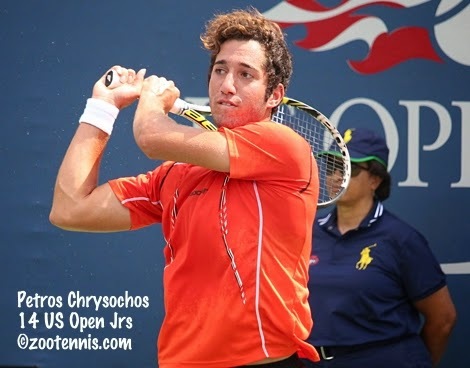 2 seed Petros Chrysochos of Cyprus won the boys singles, defeating top seed Yunseong Chung of Korea 5-7, 6-0, 7-5. Three American juniors made the quarterfinals, No. 5 seed Jessica Ho and unseeded Mwendwa Mbithi and Jack Barber. Jessica Golovin lost in the doubles final, with she and her partner Aiava falling to Gabby Ruse of Romania and Vera Lapko of Belarus 7-5, 6-0. 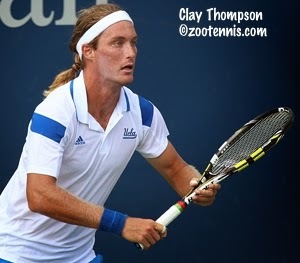 Alafia Ayeni was another American reaching the doubles final; he and Stefanos Tsitsipas of Greece lost to Chung and Seongchan Hong of Korea 1-6, 6-3, 10-7. In other parts of the world, Ally Miller Krasilnikov took the singles title in the Togo Grade 4, with the No. 2 seed defeating top seed Nicole Dzenga of Zimbabwe 6-4, 7-5 in the final. Krasilnikov also reached the doubles final. At the Honduras Grade 5, top John Jorgeson won an all-American final, defeating No. 4 seed Xavier Oshinowo 6-0, 6-1. Jorgeson and Nikola Samardzic, the No. 2 seeds, won the doubles title. 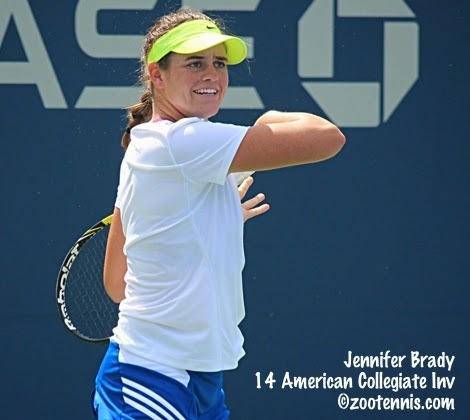 UCLA sophomore Jennifer Brady is taking the fall off to play Pro Circuit tournaments (according to this New York Times article, at the behest of the USTA) and she got off to an excellent start by winning the singles and doubles titles at the $25,000 tournament in Redding, Calif. The unseeded 19-year-old, who didn't lose a set in her five victories, beat top seed Mayo Hibi in the quarterfinals and No. 3 seed Zuzana Zlochova of Slovakia in the semifinals. She met doubles partner Lauren Embree, the former Gator star, in the final today, handily winning that match 6-2, 6-1. When I spoke to Brady after her loss to Jamie Loeb at the American Collegiate Invitational in New York, she said she had been working with the USTA throughout the three weeks of the Open (she lost in the first round of qualifying to Carina Witthoeft of Germany) and would continue to do so this fall. "I'm going to train in Boca at USTA and play a bunch of Challengers in the next couple of months," said Brady, who also received a US Open wild card in women's doubles with Samantha Crawford. "It's been a great experience, a lot of fun," she said of her long stay in New York. Embree, who returned to competition a couple of months ago after hip surgery kept her out for the first half of the year, was also unseeded in singles, and the pair was unseeded in doubles as well. They won all their matches without needing a match tiebreaker however, defeating Cal-Irvine twins Kat and Alexandra Facey, also unseeded, 6-3, 6-2. Embree had won the doubles title last year with Brady's teammate Robin Anderson; it is Brady's third title, but first at the $25,000 level. Like Brady, Claremont Futures champion Dennis Nevolo also claimed his first ITF Circuit title, and he too did so without dropping a set. The top-seeded Nevolo, a 2012 Illinois graduate, defeated No. 4 seed Salvatore Caruso of Italy 6-4, 6-2 in the singles final of the $10,000 tournament. He and Jeff Dadamo captured the doubles title when Deiton Baughman and Reilly Opelka retired down 5-2 in the first set. CLAREMONT, Calif., (Sept. 13, 2014) – Dennis Nevolo sure picked a great time to play some of the best tennis of his career. The 24-year-old former Illinois All-American and top-seeded Nevolo picked up his first USTA Pro Circuit $10,000 Futures singles title by beating No. 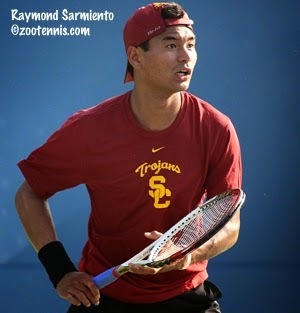 4-sseded Salvatore Caruso of Italy on Sunday, 6-4, 6-2, at the Claremont Club Pro Classic. Playing an experienced red-clay player like Caruso, who Nevolo had beaten last October in the pairs’ only previous meeting, Nevolo said he had to take time away from the steady baseline game of the 21-year-old from a tiny village outside of Sicily. Last year, Caruso got to as high as No. 320 in the world and played $50,000 Challenger events in Tiburon and Napa. Last year he won his first ITF Futures singles title in Italy. Watched by his grandparents, Nevolo will drive to their home an hour northwest in Torrance and get ready for a Wednesday start at the Costa Mesa Futures tournament. The final Challenger of the year on the USTA Pro Circuit schedule Nevolo referenced begins Nov. 10 and will take place on Nevolo’s college courts at the Atkins Tennis Center in Champaign, Ill. 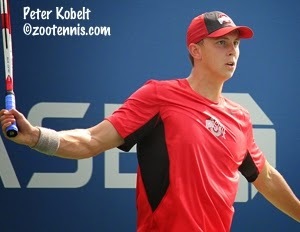 In tournaments outside the United States, Bjorn Fratangelo won his second consecutive $15,000 Futures tournament in Canada, with the top seed beating No. 7 seed Eric Quigley, Kentucky's 2012 NCAA finalist, 6-4, 6-2. Nik Scholtz, who is taking the fall off but could return for his senior year at Ole Miss, won his third Futures title of the summer and the first outside his home country of South Africa, today in a $10,000 tournament in Turkey. Scholtz, the No. 8 seed, defeated No. 2 seed and former Fresno State star Remi Boutillier of France 6-4, 3-6, 7-6(2) in the final. This week's Pro Circuit events are a women's $75,000 tournament in Albuquerque New Mexico, and another $10,000 Futures, this one in Costa Mesa, California, for the men. Another $15,000 Futures in Canada is also on the schedule. This weekend in suburban Chicago, the United States retained its place in the 16-nation Davis Cup World Group, defeating Slovakia 5-0. John Isner and Sam Querrey won singles matches on Friday and the Bryan twins clinched the tie with a straightforward doubles victory on Saturday. For more on the tie, see this article from Sandy Harwitt. Spain will not be among the World Group nations in 2015, losing to Brazil today, and Serbia is currently tied at 2-2 with India, with rain delaying the deciding match until Monday. Switzerland and France will play for the 2014 Davis Cup in November after wins over Italy and the Czech Republic in this weekend's semifinals.